Do you know the magic of this seeds? We are using these seeds in a pickle it gives a good taste as well as smell .if we will add these granules in Idli batter it easily make fermentation. We can make dal of it, we can make separate pickle also. In so many subji’s also it increases good taste as well as smell. 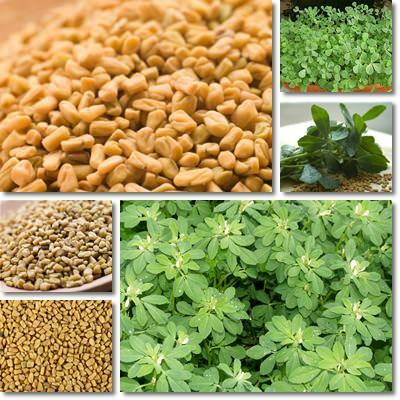 Fenugreek is a herb we can use it in plenty of way .It’s leaves contains A vitamin along with potassium mineral. Generally this plant grows in winter season. In India a lot of people making it’s Subji or eating it as a raw leaves. Some Caterours keeping dry Fenugreek leaves to make any time Subji. They are calling it Kasoori Methi. Generally we call it Methi in Hindi. But in different states people says in different names. Let us we will see what are its benefits in detail.? Take 1 spoon of Fenugreek seeds with water it can remove the digestion problem & body pain etc.If we will take 1 gm of ginger powder & 1 gm of Fenugreek powder in a day 3 or 4 times.It will give us good benefits to us.
.*We have dandruff in our hair then you can apply a paste of Fenugreek seeds & after an hour wash the hair with clean water. Wipe the hair with clean cotton clothes automatically dandruff will remove cleanly. *At night keep Fenugreek seeds in the hot coconut oil & in the morning apply it on the hair it can stop breaking of hairs. HOW TO USE IT FOR ARTHRITIS? It can remove cough of the chest as well as gas in the stomach if we will take its powder regularly. In them, if we will eat this powder with jaggery then it can remove arthritis cure. HOW IT WORK FOR DIABETES ? It has lots of fiber & steroid which can work on insulin means they are increasing the sensitivity of insulin hormone as well as it can control cholesterol along with it increases immunity power also. To reduce high blood pressure these are very beneficial. For that, you have to keep 1/2 tabs seeds of it to soak at night & in the morning we have to eat it. A paste of Fenugreek seeds when applying on the dark circle of burning spot then it can remove spot easily. If we will take Fenugreek seeds regularly then it can use to reduce weight & keep balance in the hormones. If ladies can use every day it is very beneficial for them. I soak methi seeds in water at night and have it on empty stomach in the morn. Good diabetes. Thanks Pranita for sharing these many solutions for different ailments,.